People have been troubled with this disease since ancient times, and it is still a typical recalcitrant disease. The patient suffers from difficult respiration and pain. This disease is generally caused by allergies, and it is influenced by the environment and the individual's particular constitution and emotional makeup. The symptoms of this disease are severe cough, wheezing, difficult respiration, pain in the chest, purple fingers and lips (cyanosis), sweat, and chilling of the hands and feet. With bronchial asthma, it is necessary to make a clear distinction between treatment for initial attacks and treatment for remissions. If an initial attack is particularly severe, Chinese herbs alone are insufficient. The best that may be expected is that they will lessen the side effects of Western medications which have been used to treat the condition. Although the aforementioned level of effectiveness is all that may be predicted for initial attacks, Chinese herbs are relatively effective for the treatment of remissions. With these treatments, the period of time between attacks can be lengthened, and it is possible that patients could live out their lives without experiencing a relapse. Surface-treating formulas are used to treat initial attacks, while interior-treating formulas are suitable for remissions. The Patient should take antihistamine under a doctor's guidance. In severe cases, ACTH (Cortisone) is especially effective. In some cases the patient may need to live in a sanitarium during convalescence. Stimulation of the skin, supersonic therapy, anion therapy, finger pressure, or spinal column adjustment therapy may produce good results. In treating initial attacks, Ma-huang and Apricot Seed Combination is used for fever conformations, and Minor Blue Dragon Combination for chill conformations. In defining these conformations, those with red faces who like to drink cold water and have no chills should take Ma-huang and Apricot Seed Combination; and those whose faces are relatively pale, who sneeze, get chills and have runny noses, should take Minor Blue Dragon Combination. However, if the face is red and the nose runny with excessive sneezing (remember that in these cases, scanty amounts of thick nasal discharge is the norm), Minor Blue Dragon plus Gypsum Combination can be used if one decocts it from the crude herbs. If one uses ready-made extracts, the treatment of choice is Minor Blue Dragon Combination with Ma-huang and Apricot Seed Combination. Five Tiger Combination, made by adding morus to Ma-huang and Apricot Seed Combination, may be used in the same manner. However, Five Tiger Combination is preferred for an initial attack which is becoming more intermittent, and is becoming a case in remission. Ma-huang and Magnolia Combination is another formula for these conformations, which is like Minor Blue Dragon Combination in that it is a derivative of Ma-huang Combination. Although this formula is also used to treat those with poor facial complexions, it differs from Minor Blue Dragon Combination in that, rather than treating sneezes and runny noses, its effect is concentrated on the alleviation of respiratory difficulties and coughs. In the intermittent of remissive stage, when the condition has become half-surface/half-interior, and if it is part of a fever conformation, bupleurum formulas are prescribed. If the patient has a strong conformation, Major Bupleurum Combination is given, usually in combination with Pinellia and Magnolia Combination. This formula is called Bupleurum and Magnolia Combination, and can be used to treat all patients except those with exceptionally strong conformations. 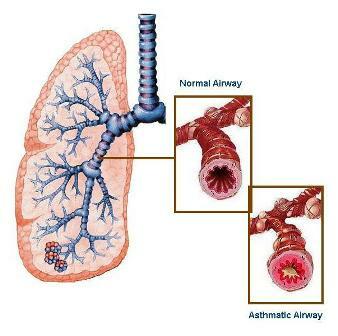 It will also improve the health of asthmatics of nearly any physical conformation. Although Four Major Herb Combination with Pinellia and Magnolia Combination is used for asthma in patients with a chill conformation, Minor Cinnamon and Peony Combination is sometimes preferred in the treatment of weak children who do not have severely damp conformations. In Japan, asthma is called "water poison," and as a point of fact, most cases of asthma fall into the damp conformation category. Minor Blue Dragon Combination, Ma-huang and Magnolia Combination, Pinellia and Magnolia Combination, and Four Major Herb Combination are all drying formulas. However, some patients with asthma exhibit no wheezing or gurgling wet sounds and experience only extreme respiratory difficulty with dry, hacking coughs. Ophiopogon Combination is suitable for such cases.